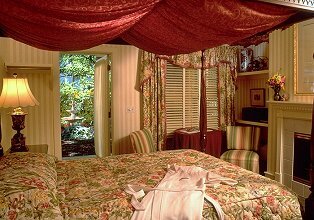 Hidden Garden Cottages are perfect for guests seeking a more private Bed and Breakfast experience. Designed for two, these elegantly furnished cottages are tucked away in the downtown area, offering a convenient yet quiet location to all of Saugatuck's shopping, dining and attractions. Featured in Travel Holiday magazine, September 1998. Each cottage features a queen bed, fireplace, whirlpool for two, private porch, TV/VCR with selection of movies, phone, mini-kitchen and continental-plus breakfast. No minimum stay requirement. Reservations recommended. We require a deposit by credit card. Cancellations must be made seven days in advance for refund of deposit. No smoking please. This and other Saugatuck Bed and Breakfast Inns can be found here in The Register.